We are a leading Manufacturer of golden look metal wall hanging om decorative gift item, antique look metal wall hanging lord ganesha decorative gift, gold plated metal wall hanging lord ganesha decorative gift and brass look wall hanging lord ganesh face decorative gift it from Ghaziabad, India. Golden Look Metal Wall Hanging OM are specially designed and coated with Metal look to make it much more attractive and decorative. These Golden Look Metal Wall Hanging OM are manufactured using one of the most durable and exclusive quality raw materials which makes it much sturdy and long lasting. Our Golden Look Metal Wall Hanging OM are available for our clients at a very reasonable range of prices.
" 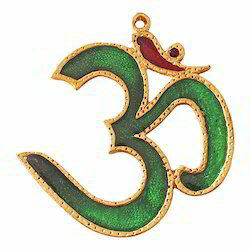 Handicrafts Wall Hanging Metal OM shaped with Meena in Metal religious scilpture for Puja/ home decoration/ Gifting purpose "
Antique Look Metal Wall Hanging Lord Ganesha are specially designed and coated with Metal look to make it much more attractive and decorative. These Antique Look Metal Wall Hanging Lord Ganesha are manufactured using one of the most durable and exclusive quality raw materials which makes it much sturdy and long lasting. 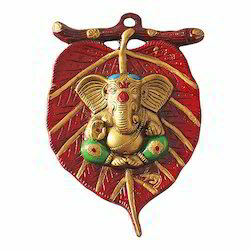 Our Antique Look Metal Wall Hanging Lord Ganesha are available for our clients at a very reasonable range of prices.
" Handicraft Hindu Lord Ganesha Metal Wall Hanging Sculpture on Leaf God Ganesh Idol Home Decor Decorative Wall Mask for Office/ Gifting Purpose "
Gold Plated Metal Wall Hanging Lord Ganesha are specially designed and coated with Metal look to make it much more attractive and decorative. These Gold Plated Metal Wall Hanging Lord Ganesha are manufactured using one of the most durable and exclusive quality raw materials which makes it much sturdy and long lasting. 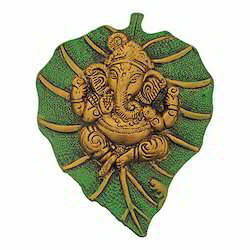 Our Gold Plated Metal Wall Hanging Lord Ganesha are available for our clients at a very reasonable range of prices. "Handicraft Hindu Lord Ganesha Metal Wall Hanging Sculpture on Leaf God Ganesh Idol Home Decor Decorative Wall Mask for Office/ Gifting Purpose "
Brass Look Wall Hanging Lord Ganesh Face are specially designed and coated with Metal look to make it much more attractive and decorative. 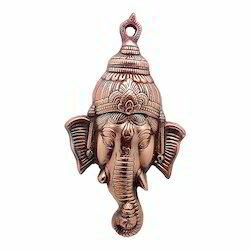 These Brass Look Wall Hanging Lord Ganesh Face are manufactured using one of the most durable and exclusive quality raw materials which makes it much sturdy and long lasting. Our Brass Look Wall Hanging Lord Ganesh Face are available for our clients at a very reasonable range of prices.
" Handcrafted Lord Ganesh Wall Hanging - Ganpati Face Handicraft Wall Showpiece for Wall Decor, Room Decor, Home Decor and Gifts "